By all definitions, the number of homeless children reached an all-time high in the last fiscal year, with a record 42,888 children having slept in New York City shelters. On Tuesday, the New York City Council convened a hearing to investigate how the City is helping homeless children gain a proper education. City agency testimony provided a new perspective on the true scope of the problem. Under the Department of Education’s broad definition of homeless students (which includes both students in shelter and also those that are doubled up or living in other temporary arrangements), the number of homeless students in fiscal year 2010 was 65,921– more than quadruple the number in 2008. Testimony also made clear the difficulties homeless students face every day in New York. On average, students in shelter miss a month of school each year– more than what is allowed in order for students to advance to the next grade. Additionally, the graduation rate for homeless students is 41% compared with a citywide rate of 61%. And the Department of Homeless Services is still woefully behind in helping these kids achieve their fullest potential. DHS reported that only about 30 percent of homeless families were placed in a shelter in the school district of their youngest child, forcing many children to change schools or face long, wearying commutes. Decades of research has shown that homeless kids face significant barriers to school achievement, including health, development, and behavior problems. Studies have consistently shown that homeless children change schools more frequently, repeat grades more often, and report worse school experiences than their housed peers. Additionally, homeless children score lower on achievement tests. The single best way to address these problems affecting homeless students is to reduce the number of homeless children. The proven way to do this is to return to the successful policies of targeting Federal and City housing resources to help homeless children and families move from shelter to permanent housing. Read our public testimony here. We have a record number of homeless New Yorkers living in our emergency shelters. Over 40,000 people, including more that 16,000 girls and boys don’t have a home. When you make one million dollars a year, it’s easy to forget what that means. It means you don’t know where you are going to sleep at night. For many kids, it means they don’t know if they will make it to school tomorrow morning. The lack of stability means your children will likely fall behind in their education, because they aren’t getting enough sleep, decent food and a stable place to concentrate and do their homework. Given the record homelessness in NYC, it’s absolutely unconscionable that Mayor Bloomberg and Governor Cuomo are even considering allowing the Millionaire’s Tax to expire. Right now…as we speak….this is the first time in modern NYC history that we have NO plan to house any of the families with vulnerable children who are homeless. It’s TIME for the millionaires to pay their fair share. Sixteen thousand homeless children need our help – EVERYONE must do the right thing and pay their fair share!!!! 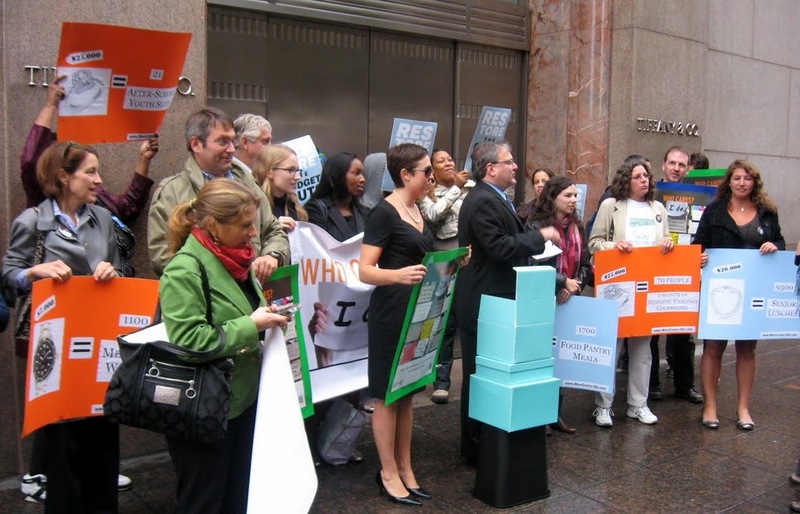 This morning, the Coalition for the Homeless joined advocates and service providers at an “Austerity Breakfast at Tiffany’s,” held outside the iconic Tiffany and Co. store on Fifth Avenue. The ‘Austerity Breakfast’ was organized to push for the renewal of the millionaire’s tax, which is set to expire at the end of this year, and also to thank wealthy New Yorkers who are willing to give up tax breaks to pay for essential services for New Yorkers in need. On December 31, the New York State personal income tax surcharge on millionaires is set to expire, giving wealthy New Yorkers a $5 billion tax break, at the expense of emergency food programs, homelessness prevention, senior services, education, and a host of other essential services. At the ‘Austerity Breakfast,’ advocates put into concrete terms the amount of services that would be lost with the end of the millionaire’s tax. A mock Holly Golightly presented the Coalition for the Homeless with a $7,000 watch worth enough to provide 3,500 emergency meals to homeless men and women sleeping on the streets. “With record numbers of homeless children and families, cutbacks to vital services, and emergency food programs unable to meet the rising need, now is obviously not the time to give a tax break to the wealthiest New Yorkers. 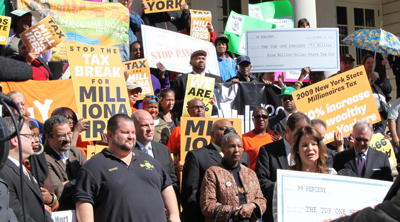 We’re thankful that some of New York’s well-to-do recognize that eliminating the millionaires tax is wrong for vulnerable kids and families and wrong for New York,” said Coaliton for the Homeless Policy Analyst, Giselle Routhier.